"Oh, it's terrible cover letter." Probably every time you sit down to write it, you think something like that. And surely you have repeatedly thought: "Is a standard resume really not enough? Does someone read my cover letters?" No, not enough. Yes, recruiters do read cover letters. And this is a great opportunity to tell the potential employer who you are, and to show why you need to be hired. 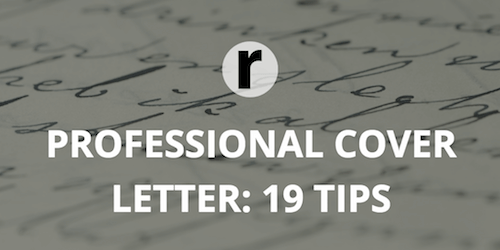 Today Resumance shares simple recommendations to help you create the perfect cover letter, both in form and content. What can you do for the company? The common mistake of many job seekers is to talk about how the company will help them. Honestly, recruiters are more interested in knowing what the candidate will be able to do for the company in case of receiving a position. Instead of repeating your experience and achievements at the previous job again, use a cover letter to describe the details that were not included in the resume. A cover letter gives you freedom of action. Don't miss the chance to explain the main points of your resume and tell a live story why you are ideally suited to the company. Use simple sentences, you can even joke. Perhaps you write the cover letter for the first time in your life. In this case, we strongly recommend that you read the well-written templates. Resume maker tools usually provide them for free or for a small fee. In addition to explaining what you did in the past, show the recruiter what you can do in the future. Carefully read the vacancy text and determine what the employer needs. When you realize that you have the potential to do this work, but your past experience does not fully match the job, focus on your skills. Some candidates, realizing that their experience is irrelevant to the requirements of the vacancy, begin to excuse themselves: "Despite my limited experience in sales ..." Instead of drawing attention to your shortcomings, focus on strengths. Try also to convey your enthusiasm and commitment to the position. Yesterday's students and young specialists love to describe their education. But HR managers want to see the experience of such candidates. Include volunteer work or internships, and what you can do on your first working day. Sometimes the numbers speak louder than words. Use performance statistics to illustrate your professional influence on the organization you worked in before. Employers like to see numbers. Why do you want to work for this company? Perhaps its products have changed your life. Or, for many years you passed by the building in which its office is located, and dreamed of working here. Don't hesitate to tell such lovely stories. They must be short and clear. Is the phrase "I'm interested in a job and want to work in your beautiful firm" filled with sincerity? Not really. It seems that the robot wrote it. When composing a cover letter, be yourself, show friendliness, write freely and simply. If you have a template like "Dear recruiting manager, I really want to work in your company and I hope that I can realize my potential for such and such a position", remove it and never send it to anyone. For each vacancy write unique letters, so that the recruiters would like to respond to them. The cover letter should not be boring. There are many ways to revitalize it. Are you planning to work in a startup? Make the letter creative. Play around with formats, visualize the data, shoot a video, tell the story in pictures. Most likely, your chances of getting a call from a recruiter will increase. Stand out, but know when to stop. When you have created an unusual cover letter, ask someone in your family to read it. If he approves, then safely send your creation. Add a catchy title to your letter. For example: "3 reasons why I perfectly fit the Sales Manager position"
It's hard to say how many applicants use the words "sociable, stress-resistant, work well in a team", etc. Change the adjectives and write like an ordinary person. If the cover letter is written honestly, from the heart, not from the template, then it feels right away. A cover letter is a good way to show that you understand the company's corporate values and prove that they are not alien to you. Also, when writing a text, always think about the person who will read it. If it's not easy for you to write, then try to write a letter to yourself from the point of view of a friend, mentor or previous employer. Try to know in advance the name and surname of the person who will receive the cover letter. You can find out this information in the job description or on the company website. Avoid "Hello, the man who came across my letter." Don't know the name? Limit yourself to the greeting. You can check the letter for errors with the help of online spell check services. Then, let the text stay for 12 hours. When you read it again, you can see a mistake that was not noticed yesterday. Perhaps the most useful thing that Resumance advises regarding the cover letter is: be different. After all, the most memorable cover letters made people who are least likely to take care of the rules, but follow the heart and common sense.